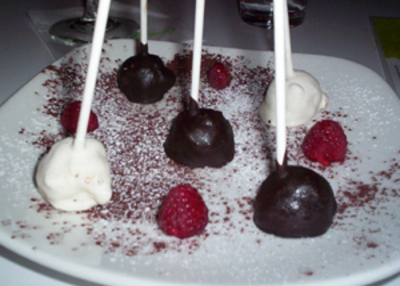 dessert of dark- and white-chocolate covered cheesecake pops! My bi-continental colocotaire (flatmate) just received his first round of funding to launch his hi-tech start-up so to celebrate we went to Lime on Market Street. A few parking spaces are reserved along the wall across the street at the Thai Restaurant parking lot. For those of you not from San Francisco, it's hard to describe the sheer joy at finding an available reserved parking spot! It elicits high-fives, fist pumping and various other unprintable exclamations. Self-described as “1960's era modernist”, walking into Lime is like walking into George Jetson's home.... Click here to read the entire story.